Please scroll down for Touring Programs. To engage Vox Dance Theatre, call US cell 310-403-6134 or email: sarahvox@earthlink.net. Vox is on Viber. ¿Tienen una pregunta en español? O, avete una domanda in italiano? e-mail a: Enzo Fina. Watch our Brigantesse promotional video in English here! Guarda il nostro video promozionale Brigantesse in italiano qui! Browse our photo album on Facebook. When requesting press kits or extended videos, please specify hardcopy or electronic. Powerful episodes abstracted from the lives of the ferocious women of the legendary Briganti outlaws of 19th century Southern Italy. Rich, dramatic and fiery, with electrifying movement. Uniquely arranged traditional music and potent rhythms by Musicántica, recalling the folk music of the Briganti. Using only their gowns and a thundering polymetric score by Philip Glass, seven brides face down one of our most loaded rituals, marriage. Employing potent imagery and a spirited rhythmic attack, Fimmine exhibits the devotion, sisterhood, and fierce passion these women summon on their way to the altar. The signature work of Artistic Director, Sarah Swenson. A suite of sensual dances set to four passionate Spanish songs by the late Canadian vocalist, Lhasa de Sela, looks at three heartfelt stories of love and destiny, beautifully partnered by 200 silk flowers. Evening length and mini-performances by Vox Dance Theatre from the current repertoire. Vox Dance Theatre conducts workshops in the company's current and former repertoire, leading to informal performances. Sarah Swenson is a professional performance coach and is experienced in developing artistry, performance skills, and technique in young dancers and pre-professionals. Choreography especially for children and youth is available for staging and informal performance. Master Classes in the dance technique of Los Angeles modern dance pioneer Lester Horton, taught by Sarah Swenson, as well as classes in her own fusion of classical modern styles, or classes in the Merce Cunningham technique taught by senior company member Tamsin Carlson, former Cunningham faculty member and RUG dancer. Custom designed dance classes and performance workshops, for all ages and abilities. Fun and accessible to all! The company offers history and demonstration of the Lester Horton technique, and the particular physical training required for modern dancers. In open rehearsal style, excerpts from our repertoire are performed informally, with time for Q & A. Local dancers and other artists perform on stage with Vox Dance Theatre - selected residencies. Sarah Swenson and company members enjoy discussing the work, answering questions, and hearing commentary from viewers. 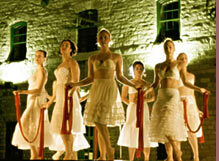 Vox Dance Theatre are available for gratis or low cost performances for certain organizations, depending on location. When Musicantica artists Enzo Fina and Roberto Catalano tour with Vox Dance Theatre, a variety of workshops in musical instruments and dance of the Mediterranean are available. Visit Musicantica.org and select Workshops.